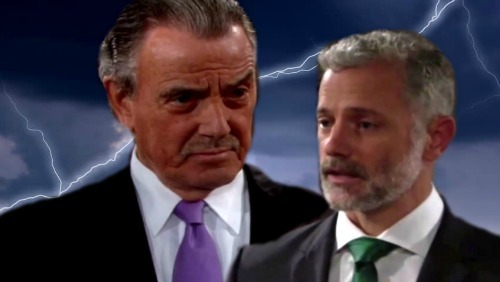 The Young and the Restless (Y&R) spoilers tease that the Abbotts will face a crisis they didn’t see coming. Ashley (Eileen Davidson) intends to dig deeper into Myrna’s (Marcia Dodd) background. She’s hoping to find out more about Myrna’s time in Genoa City. If Ashley can learn where Myrna worked and what she was all about, perhaps she can discover why Graham (Max Shippee) is manipulating Dina (Marla Adams). Ravi (Abhi Sinha) will do his best to help Ashley gather more information, but they may regret it. It’s not a good idea to cross the guy who’s out for revenge. However, there’s probably nothing that could stop Graham’s plot anyway. Myrna is there to keep Graham on track, so he’ll forge ahead with his scheme. The Young and the Restless spoilers indicate that the Abbott clan will soon be stuck in turmoil. It could all start with Ravi and Ashley’s research. Will they find out that Graham is actually Brent Davis’ son? If so, Ashley may confront Graham about what kind of twisted game he’s playing. Graham will undoubtedly spill his sob story at some point. He’ll insist that his family suffered, so Dina and her brood need to pay. You can bet that a shocking Y&R showdown is coming up. Ashley and Graham will have a chance to rip into each other like never before. Whether this faceoff happens before or after the truth comes out, things are sure to get messy. Ashley will be crushed when the world learns she’s not John’s (Jerry Douglas) biological daughter. The family members she’s left out of the loop will feel blindsided. Abby (Melissa Ordway) will be particularly distraught. She’ll suddenly have to deal with the fact that she’s not a true Abbott. Abby will likely lash out at both Ashley and Victor (Eric Braeden) for their deception. 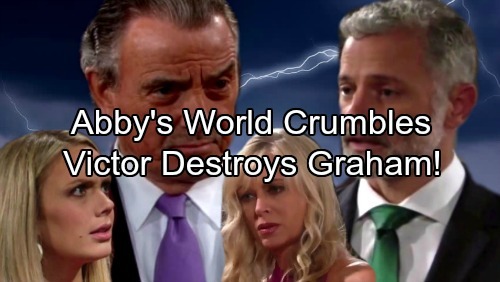 When Victor sees how upset Abby is, Graham could make a dangerous enemy. Victor is on Dina’s side thanks to the cabin photos and their mutual disapproval of Jack’s (Peter Bergman) romance with Nikki (Melody Thomas Scott). He could easily help Dina turn the tables on Graham the troublemaker. Would you like to see Victor pitch in with Graham’s destruction? Will Graham face his own life-changing downfall? We’ll give you updates as other Young and the Restless news comes in. Stay tuned to Y&R and don’t forget to check CDL often for the latest Young and the Restless spoilers, updates and news. The Young and the Restless Spoilers: Sharon Trapped, Forced to Rely on Alice – Zack Wants Sharon Dead, Can Scott Save Her?